Lease for $636/month for 48 months with $5,674 due at signing including $0 Security Deposit and 10,000 miles per year. Payment expires on 04/30/19. Estimated Lease payment based on 48 months and $5,674 due at lease signing. Cash due at signing includes $7,539 capitalization cost reduction, which includes $795 acquisition fee, plus a required security deposit of $0, and first month's lease payment of $636. Excludes title, taxes, registration, and license fees. Total monthly payments equal $38,066. Mileage charge of $0.25 per mile over 10,000 miles. Not all consumers will qualify. Residency restrictions may apply. Available on approved credit to very well qualified customers through Lexus Financial Services and participating Lexus dealers on a new 2019 GS 350. 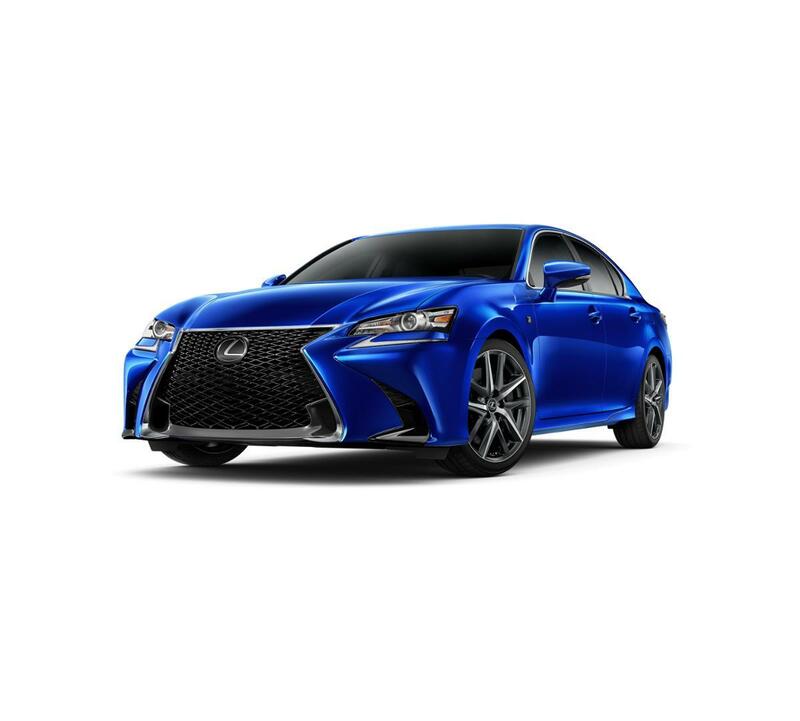 Security deposit required with exception of prior Lexus Financial Services financing history and/or Lexus Financial Services tier rating in which a security deposit may be waived. Not all customers will qualify. Offer based on MSRP of $53,910 including delivery, processing and handling. Offer already includes $2,500 in Lease Cash incentives applied as a capitalized cost reduction. Monthly payment may vary depending on final price of vehicle & your qualifications. You pay $0.25 per mile over 10,000 per year. See dealer for vehicle and lease program details. Must take delivery by 04/30/2019. Offer available in AR, LA, MS, OK, TX. Lexus Financial Services is a division of Toyota Motor Credit Corporation (TMCC). TMCC is the authorized attorney-in-fact and servicer for Toyota Lease Trust. Offer available on approved credit to very well qualified customers through Lexus Financial Services and participating Lexus dealers on a new 2019 GS 350 F SPORT. Only a limited number of customers will qualify for advertised APR. No down payment required if qualified. Must take delivery from available dealer stock by 04/30/2019. See your local participating dealer for other finance program limits, qualifications and terms. Lexus Financial Services is a service mark of Toyota Motor Credit Corporation. Offer available on approved credit to very well qualified customers through Lexus Financial Services and participating Lexus dealers on a new 2019 GS 350 AWD. Only a limited number of customers will qualify for advertised APR. No down payment required if qualified. Must take delivery from available dealer stock by 04/30/2019. See your local participating dealer for other finance program limits, qualifications and terms. Lexus Financial Services is a service mark of Toyota Motor Credit Corporation. Offer available on approved credit to very well qualified customers through Lexus Financial Services and participating Lexus dealers on a new 2019 GS 350 AWD F SPORT. Only a limited number of customers will qualify for advertised APR. No down payment required if qualified. Must take delivery from available dealer stock by 04/30/2019. See your local participating dealer for other finance program limits, qualifications and terms. Lexus Financial Services is a service mark of Toyota Motor Credit Corporation. Offer available on approved credit to very well qualified customers through Lexus Financial Services and participating Lexus dealers on a new 2019 GS 350. Only a limited number of customers will qualify for advertised APR. No down payment required if qualified. Must take delivery from available dealer stock by 04/30/2019. See your local participating dealer for other finance program limits, qualifications and terms. Lexus Financial Services is a service mark of Toyota Motor Credit Corporation. Offer available through participating Lexus dealers on a new 2019 GS 350 from participating dealer stock and subject to vehicle availability. Cash back available from Lexus, a division of Toyota Motor Sales, U.S.A., Inc. This offer is not compatible with special lease or finance rates offered through Lexus Financial Services. See your Lexus dealer for details. Void where prohibited. Offer available through participating Lexus dealers on a new 2019 GS 350 F SPORT from participating dealer stock and subject to vehicle availability. Cash back available from Lexus, a division of Toyota Motor Sales, U.S.A., Inc. This offer is not compatible with special lease or finance rates offered through Lexus Financial Services. See your Lexus dealer for details. Void where prohibited. Offer available through participating Lexus dealers on a new 2019 GS 350 AWD from participating dealer stock and subject to vehicle availability. Cash back available from Lexus, a division of Toyota Motor Sales, U.S.A., Inc. This offer is not compatible with special lease or finance rates offered through Lexus Financial Services. See your Lexus dealer for details. Void where prohibited. Offer available through participating Lexus dealers on a new 2019 GS 350 AWD F SPORT from participating dealer stock and subject to vehicle availability. Cash back available from Lexus, a division of Toyota Motor Sales, U.S.A., Inc. This offer is not compatible with special lease or finance rates offered through Lexus Financial Services. See your Lexus dealer for details. Void where prohibited. Prices do not include additional fees and costs of closing, including government fees and taxes, any finance charges, any dealer documentation fees, any emissions testing fees or other fees. All prices, specifications and availability subject to change without notice. Contact dealer for most current information. MPG estimates on this website are EPA estimates; your actual mileage may vary. For used vehicles, MPG estimates are EPA estimates for the vehicle when it was new. The EPA periodically modifies its MPG calculation methodology; all MPG estimates are based on the methodology in effect when the vehicles were new (please see the Fuel Economy portion of the EPAs website for details, including a MPG recalculation tool). The features and options listed are for the new 2019 Lexus GS 350 and may not apply to this specific vehicle. MSRP contains base MSRP, any factory installed options, and delivery, processing and handling charges. Delivery, processing and handling fee is based on the value of the processing, handling and delivery services Lexus provides, as well as Lexus overall pricing structure. Lexus may make a profit on the delivery, processing and handling fee.